Ok. Normally this is the best and worst of the week. But this week involved the best and worst of the Parliament itself. Here’s the #5and5. 1. At the start of Question Time, the Speaker asked for the new Members to be admitted. In walked all five. Centre Alliance Rebekha Sharkie with fellow crossbenchers on either side and Susan Lamb, Justine Keay, Josh Wilson, and our newest MP Patrick Gorman all accompanied by Bill Shorten and Tanya Plibersek. Five by-elections, and after all the bluster and false confidence, not a Liberal among them. Half the room gave them a standing ovation - you can guess which half. They were all sworn in and straight away Susan, Justine and Josh were asking questions. Patrick’s first speech will be in a few weeks’ time. 2. I’ve gone back and forth over which list to put this one in. It involves the very worst and best in the same story. It began with the first speech of a Senator who came into Parliament because he was a One Nation candidate and has since joined the Katter’s Australian Party. After nine months he finally made his first speech. Most of the publicity has been about one sentence but the whole speech was horrific. The usual protocol of shaking hands after wasn’t followed by Labor or the Greens party, but the Libs and Nats were sadly lining up to shake his hand after. Straight after, Penny Wong said "My parents were married in the dying days of the White Australia Policy… We've rightly consigned that policy to the dustbin of history." A little later I stood up in the House of Reps and went through the list of comments and policies from the Liberals that have encouraged the voices of hate speech; including their attacks on 18C of the Racial Discrimination Act and the exemptions from the university-level English test for people who have come from five English speaking nations that are predominantly white. We were furious, not only at the speech but at the complete leadership void that had opened up through the dog-whistling politics of recent times. The next morning something extraordinary happened. Bill Shorten moved and Tanya Plibersek seconded a resolution which was last moved by Bob Hawke 30 years ago. This time, it was carried unanimously. There’s a clip of the speeches here. The speeches from Ed Husic and Anne Aly were unforgettable. And the speeches from crossbenchers and Government Members including the PM and Deputy PM ensured there was a real unity across the Chamber. The long-term test won’t be whether we could make good speeches on the day though. The long-term test will be whether the race-baiting of the last few years is truly consigned to the past. 3. Centre Alliance MP Rebekha Sharkie asked the PM whether the Aboriginal and Torres Strait Islander flags could also be flown in the Chamber. Christopher Pyne took a point of order trying to stop the question. Bill Shorten stood up and said if the PM wanted to take that step he would have bipartisan support. Eventually the PM said he’d think about it. 4. It’s not often you get a result this fast. Linda Burney asked about the Centrelink robo-debt system now targeting some of the most vulnerable Australians. Minister Keenan said the Government was suspending that part of the program. Not often you get an answer where the Government concedes immediately. Michelle Rowland went one better than getting the Government to back down immediately after being asked a question. Michelle came to Tactics in the morning with a great question about how the NBN was imposing an effective internet tax on regional areas. In the lead-up to Question Time, Michelle had been doing a series of interviews and had to come back and ask for the question to be taken off the list. The Government backed down before the question was asked! 5. Each year the ABC holds a big event in Parliament House. Plenty of Labor MPs and Senators turn up to show our support for the ABC and the Government Members turn up so they can associate themselves with the ABC while steadily cutting its budget. 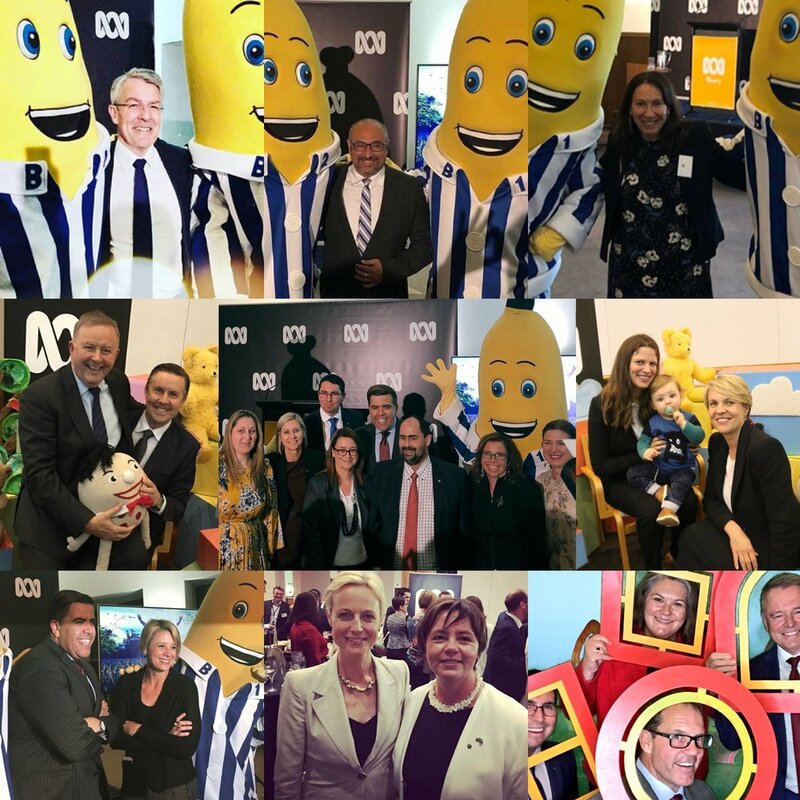 Even though the hypocrisy of those who seek to destroy the ABC is the same every year, I like to include this event in the email so you can see lots of photos of adults desperately trying to be photographed with the Bananas in Pyjamas. And in case you missed it Bill Shorten has promised a Labor Government will restore the $83 million that the Government has cut from the ABC. MARK BUTLER: My question is to the Prime Minister. Before the 2013 election this Liberal government promised to reduce power bills by $550 a year, but since then power bills have gone up and up. Today the government is again promising to reduce power bills by $550 a year. Why would Australians trust any promise this government makes about lower power bills, promises which the member for Warringah, the former Prime Minister, described today as 'merchant banker gobbledigook'? SPEAKER: The member for Gellibrand on a point of order? TIM WATTS: Yes, a point of order, Mr Speaker: is 'merchant banker gobbledigook' in order? NICK CHAMPION: My question is to the Prime Minister. Is the Prime Minister aware of media reports that, during a briefing on his energy policy, the Prime Minister said to the member for Warringah, 'Please do me the courtesy of allowing me to finish my sentence'? The member for Warringah replied, 'I would have if you allowed me the courtesy of finishing my term.' Was the Prime Minister again speaking merchant banker gobbledigook? SPEAKER: The member for Wakefield will resume his seat. That question is out of order. We'll go to the next question. 2. For months now Lib Health Minister Greg Hunt has been trying to give the impression that only Liberal Governments put new prescription drugs on the PBS. When the Prime Minister kept that up early in Question Time on Thursday Catherine King was straight on her feet with the list of drugs which have had significant delays between being recommended to be available for patients and actually being listed on the PBS by this Government. Both the PM and Greg Hunt were floored. They’ve been taking a policy that has been bipartisan for years and tried to play the politics of fear. You could see their entire attack fall apart as Catherine returned to her seat. 3. This one is tough to write. Late on Thursday our attempt to save the marine parks fell short 29 votes to 36. This locks in the largest removal of area from conservation in history. No government anywhere in the world has removed so a large area from conservation on land or sea ever before. Louise Pratt had moved the disallowance motions imploring the Senate to protect the oceans. Now the only way we can fix this is through a change of Government. I’m taking a proposal to Caucus next week and hopefully I’ll have more to tell you soon. 4. Every time the Government answers a question about the Great Barrier Reef Foundation receiving nearly half a billion dollars with no tender it looks more and more dodgy. Think about this fact, even under its own figures for private fundraising, it took the Great Barrier Reef Foundation more than 18 years to raise $58 million, and just 18 minutes with the Prime Minister to get almost half a billion dollars of taxpayers’ money. At one point Josh Frydenberg boasted “It's very well known that the Great Barrier Reef Foundation has been the largest charity with the Reef” and Chris Bowen interjected straight back “Well it is now”. 5. Scott Morrison. He quoted Taylor Swift during Question Time. It was like a giant embarrassing Dad Joke. But at least, for the sake of consistency, even when telling a joke, Scott Morrison was very, very angry. Scott Morrison. Blank Space. The final issue that is one that people who receive this email have very different views on so I didn’t want to put it in either list. The bill to return to the ACT and the Northern Territory the power to make laws about voluntary euthanasia was debated in the Senate and all parties granted a conscience vote. The bill was defeated 34-36. Next week Andrew Leigh and Luke Gosling will introduce a Private Members’ Bill on the issue to the House of Reps.
Parliament is back next week. PS overnight the “Queen of Soul” Aretha Franklin died. No song fits the week better than this: R.E.S.P.E.C.T. #5and5 Return of the safari suit.